Another Sunday, another roast. Every now and then I crave pork belly. I just do. This was one of those days. 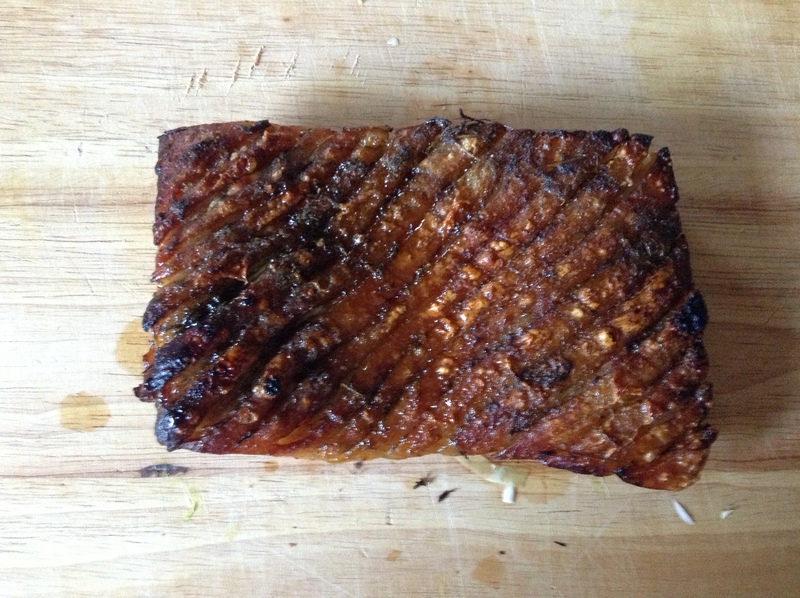 Lucky for me, Jamie Oliver came to the rescue with a great cider-braised pork belly recipe with cider mustard sauce. The main meal didn’t look so great on the plate, mainly because we were greedy and piled our plates up with so much belly, cabbage and beans that they looked like Kilamanjaro – we actually had to wear oxygen masks until we had consumed the top two inches. The picture above is the leftovers we enjoyed the night after and, to be honest, it was much better than the original. What was cabbage, cooked with a little thyme and the leftover cider I didn’t use for the pork belly, turned into a hash of cabbage and white beans, completed with the creamy cider, mustard and onion sauce I made from the pork’s braising liquid and some slow cooked onions. It had all the same flavors as the previous night’s dinner, but in a much more cohesive – and obviously more presentable – package. It was super easy and massively tasty. I mean there’s not much to quibble with pork, mustard, cider and onions, is there? 1. In a pestle and mortar, pound the thyme leaves with 1 tsp salt and 1 tsp white pepper. When broken up, add 1 Tbsp olive oil to make a paste. 2. Rub paste all over skin of pork belly, getting into the scores. 3. 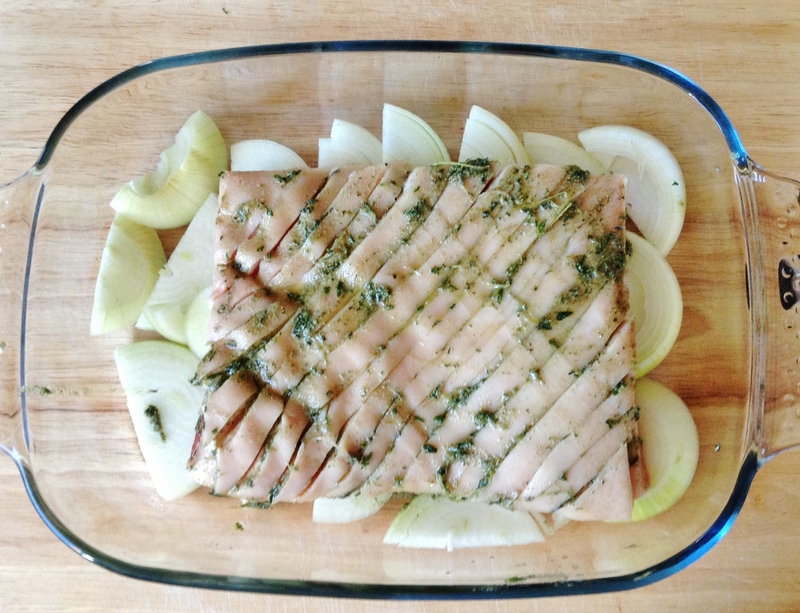 Place the pork belly on a bed of onions in a snug-fitting roasting dish, pour over 200ml of cider and double cover with foil. 4. Place the belly in a 150ºC (300ºF) oven for approximately 2 hours or until the meat comes apart easily. You may need to add more cider if it starts to dry up. 5. Remove the foil and place the pork under the broiler – watch out, it will spit like a bad’un! – until skin is browned and puffed. You may need to cover certain parts with foil if they brown quicker than the rest. Keep a close eye on it because it can burn very easily! 6. Leave the pork to rest, covered, for about 30 minutes. 7. In the meantime, cook the cabbage in some olive oil or butter until slightly softened. 8. Add the remaining cider to the cabbage and cover to steam for about 10-15 minutes until completely soft. 9. While the cabbage is cooking, place the roasting tray and juices over a medium heat, scraping up brown bits with a wooden spoon. 10. Once the roasting juices have reduced slightly, add the mustard and the cream and cook gently until slightly reduced, about 5-10 minutes. 11. Stir the mustard sauce and haricot beans into the cabbage and warm through. 12. 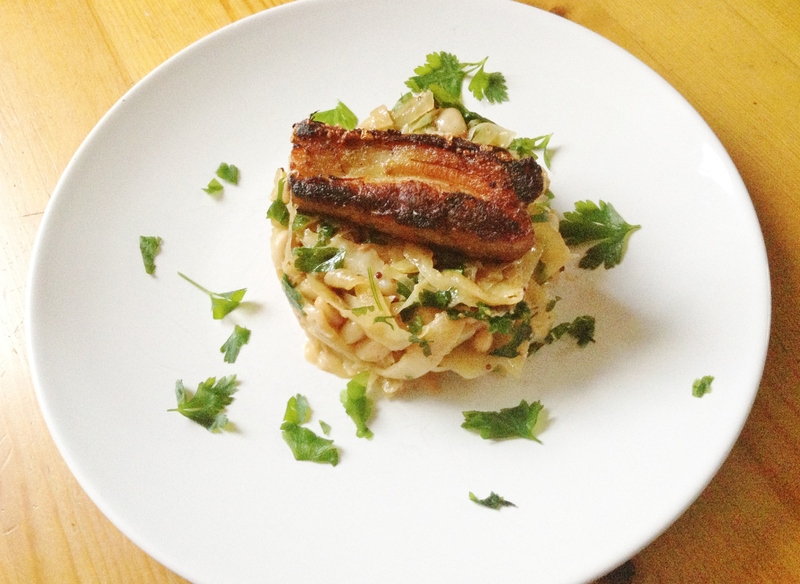 Serve slices of pork belly on top of the cabbage and haricot bean hash. This looks delicious. I really like pork belly and the idea of a cabbage, white bean hash is so new to me. I’m going to try this! It may have been your second try, but the presentation is gorgeous. If I showed you the first night’s plate, it might put you off food for life. The first night though, we had a delicious white bean mash that my hubby made. That is to come in another blog post! LMAO Nice. You are hilarious! I love pork belly. I think this is a really inventive combination. Can’t wait to try it. Thanks! As I said, there’s not much that can go wrong with pork, cider, mustard and onions. I will go ahead with that crackling first without a doubt! It was chewy and delicious! WOW, this sounds really good. Added it to my growing list of recipes to try…sigh. Nice to be back from vacation to actually be able to cook again. I suppose that is something to look forward to when coming back from vacation…but then you’re also back from vacation. Did you have a fabulous time? I was very jealous when I read what you were doing? It was amazing. So much new food to try, impressions, deserted islands…it was just great. Even visited a Thai winery! Will write about it sometime this month.